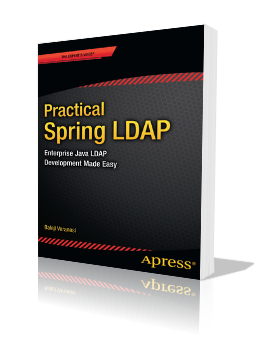 The first step in developing an enterprise level flex application is setting up a development environment. 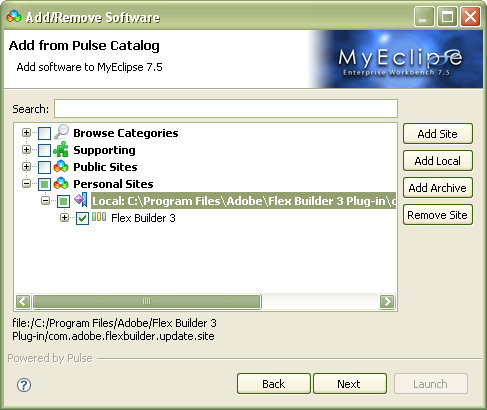 Adobe offers an eclipse based development tool called Flex builder that provides a variety of features making Flex development a breeze. 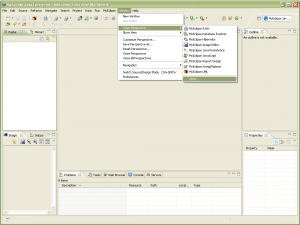 This flex builder comes in two flavors: a standalone IDE and an eclipse plugin. 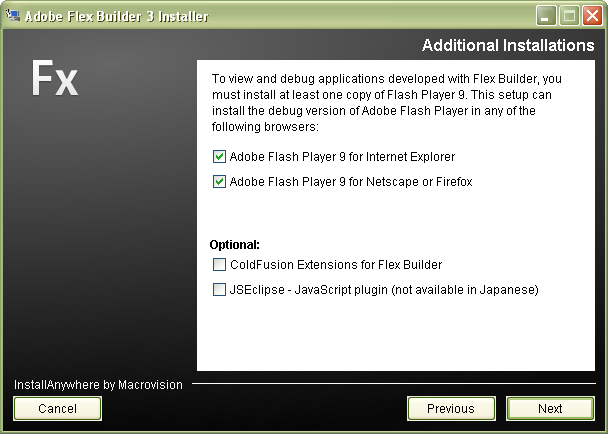 Since I will be developing Java based Flex applications, I decided to install the plugin version of the Flex builder in my favorite MyEclipse IDE. 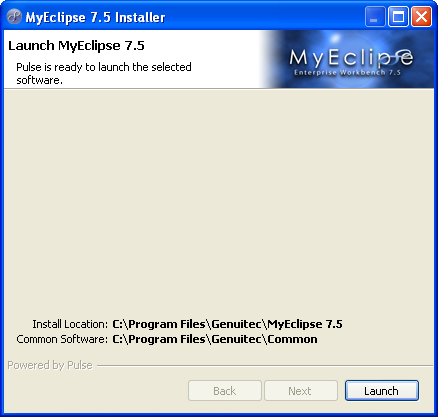 We start with MyEclipse installation. 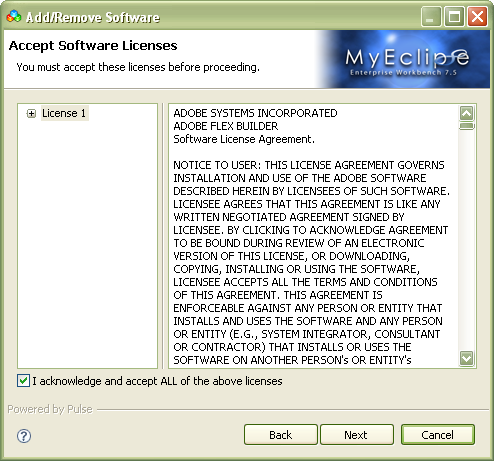 MyEclipse would then prepare and validate the installation. 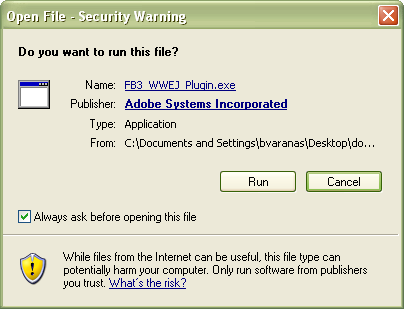 Click on Launch to install the software. 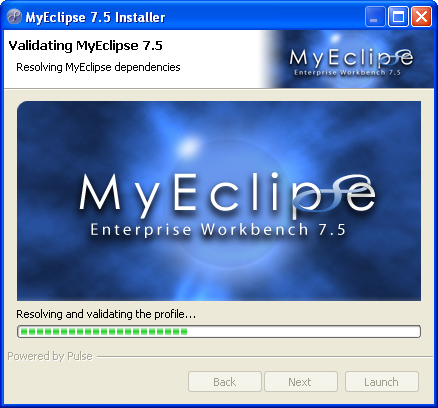 After installation is complete, MyEclipse will launch itself. 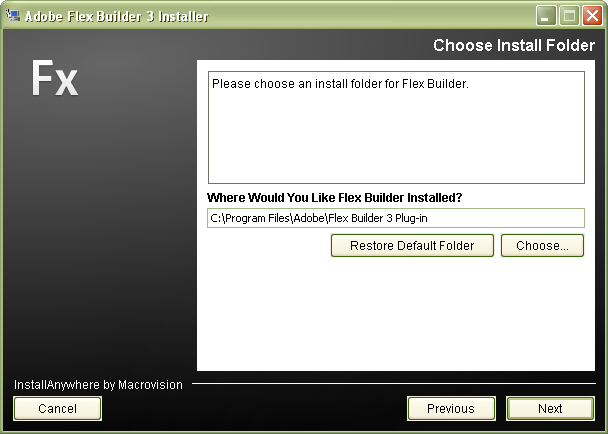 Select the default workspace and hit ok.
Now we are ready to install the Flex Builder Plugin. 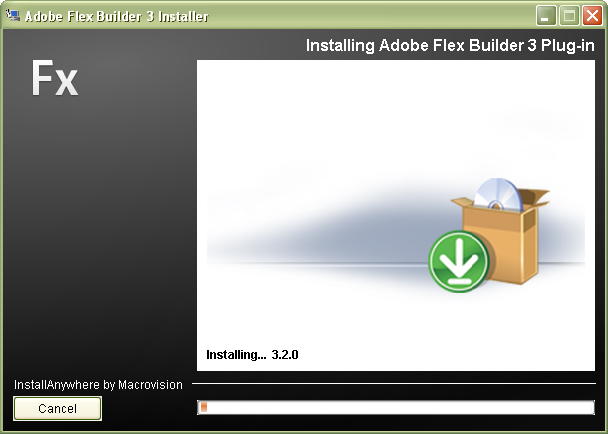 Download the Flex Builder 3 Plugin from Adobe site. Upon completion of the download, double click the installer file to launch the installation. On the next screen, select the language and hit Ok. 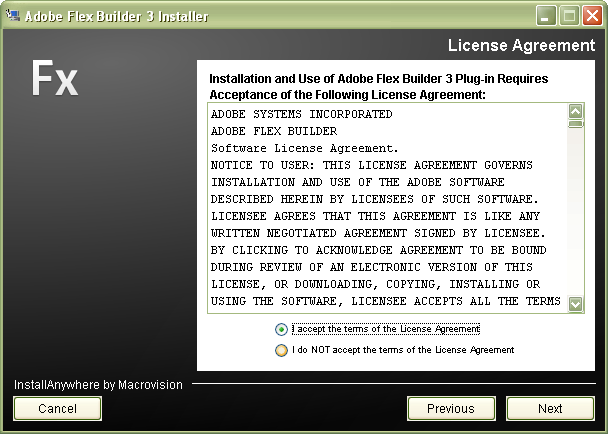 Accept the license agreement and hit Next. On the next screen you can customize the Flex Builder Plugin location. Just accept the default location and hit Next. 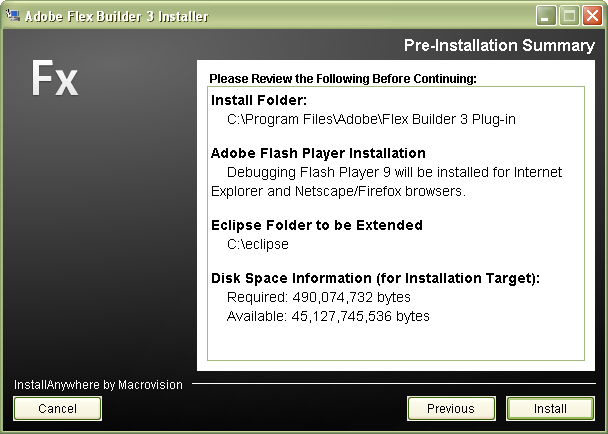 The next screen asks for an Eclipse installation folder. 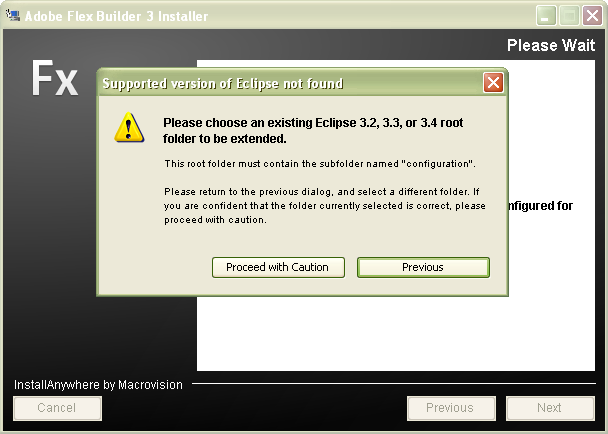 DO NOT SPECIFY AN EXISTING ECLIPSE INSTALLATION LOCATION. Create a new folder called “eclipse” in your file system (in my case I created it under C drive) and provide that location to the installer. Hit Next. On the next screen click “Proceed with Caution”. Hit Next and then Install to start the installation. 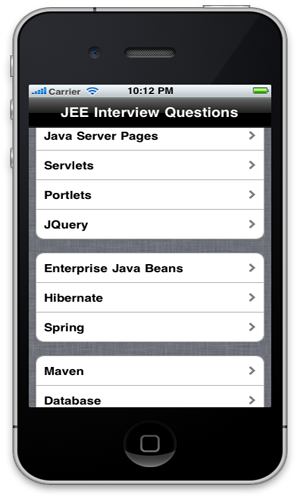 Upon completion, you should see the following screen. Go to Add/Remove Software in MyEclipse 7.5. 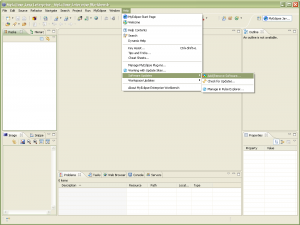 Select Personal Software and click Add. On the next screen, click Add Local. 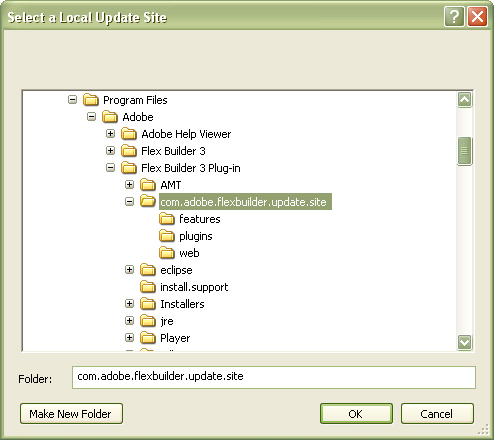 Select “com.adobe.flexbuilder.update.site” folder in your Flex Builder Plugin install folder and click ok. 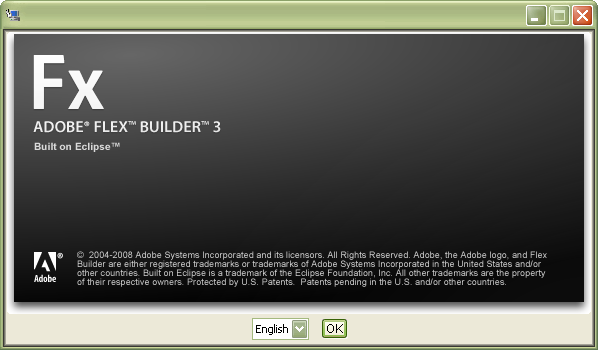 Select “Flex Builder 3” and hit Next. On the following screen hit Apply. 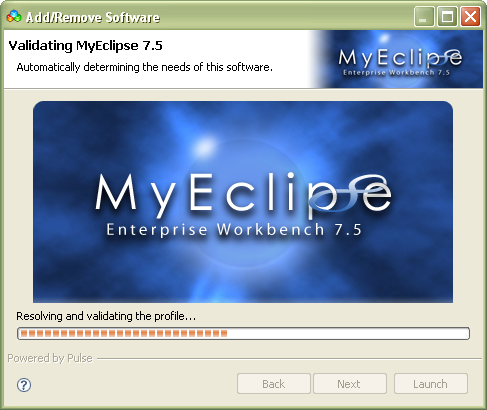 MyEclipse would perform a validation of the install. Click Update to trigger software update. 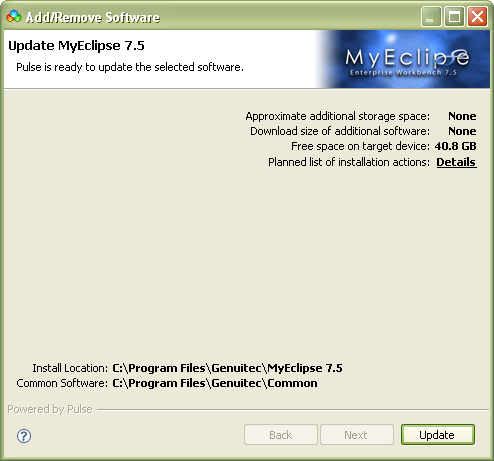 Once the update is complete, click Yes to restart MyEclipse. 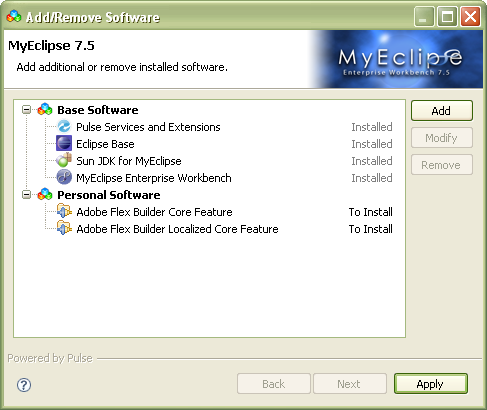 Go to “Installed Flex SDKs” in MyEclipse under Window->Preferences->Flex. You should see two SDKs installed with errors next to them. Select Flex 0.0 and hit Edit. Click Browse in the popup and browse for 2.0.1 SDK located under /sdks/2.0.1. 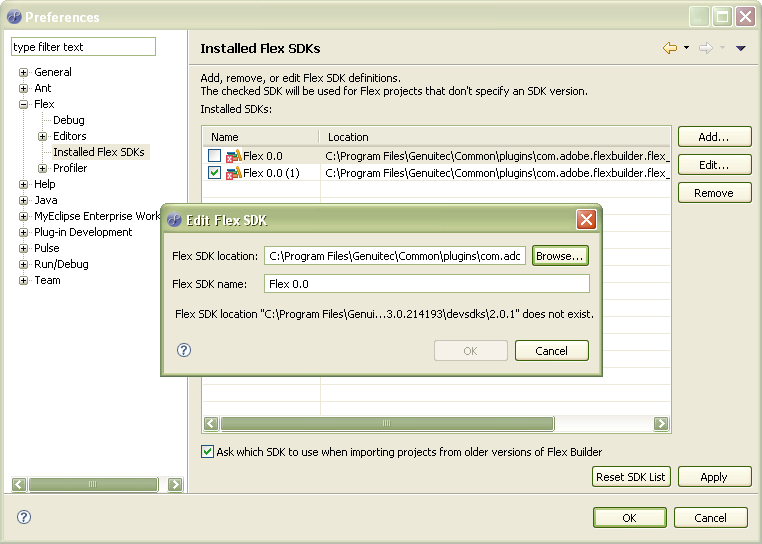 Hit Ok.
Repeat step 2 for Flex 0.0(1) and select the 3.2.0 SDK folder. This completes the plugin installation. 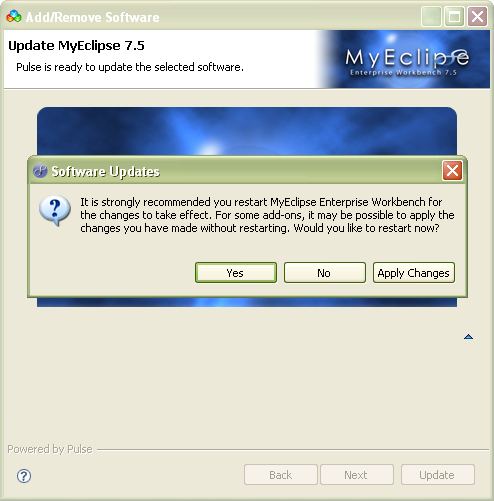 Restart MyEclipse Workbench. 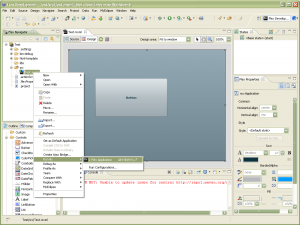 Open the Flex Builder perspective by clicking Window->Open Perspective->Other and then selecting Flex Development. 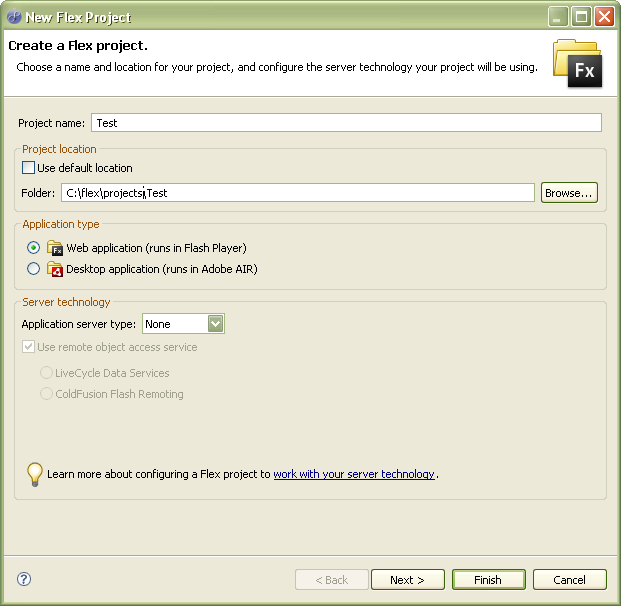 Create a new Flex Project by going to File->New->Flex Project. Enter the following project details and hit Finish. Open the Test.mxml file and go to “Design” view. 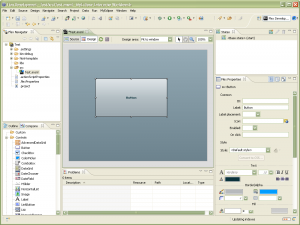 Drag a button on to the canvas and save the file. Launch the application by right clicking on Test.mxml->Run As->Flex Application. You should see the application run in your default browser. 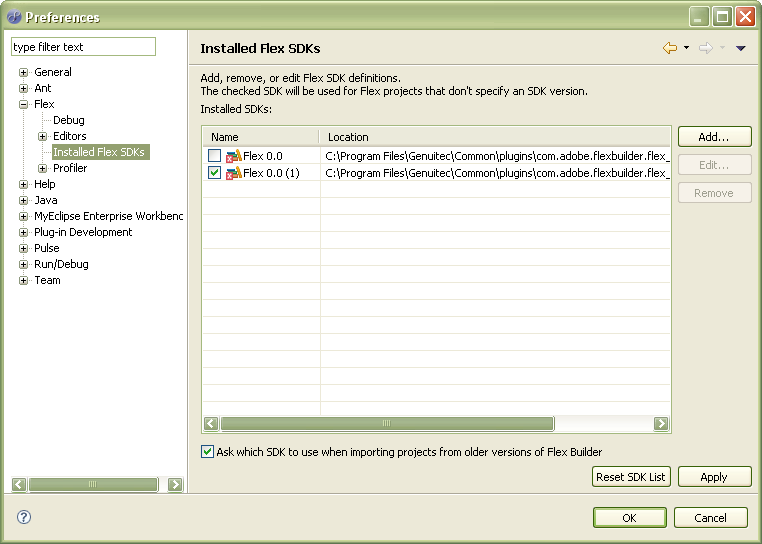 Unzip the downloaded file into /sdks/3.4.0 folder. 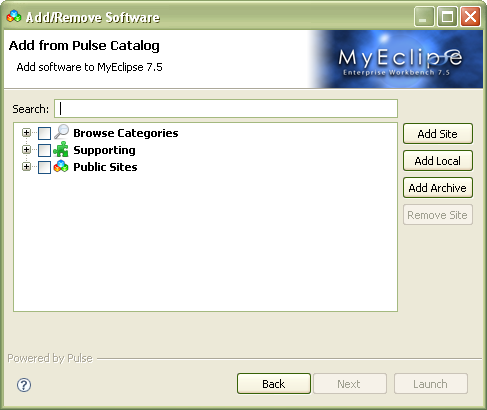 In MyEclipse go to Installed Flex SDKs and click Add. 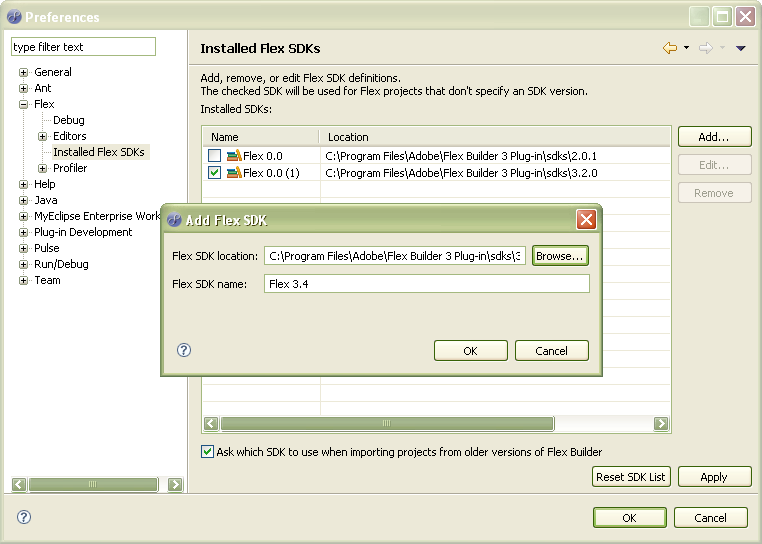 Browse for the 3.4.0 folder and enter 3.4.0 as the name and hit Ok.
Make sure that 3.4.0 SDK is selected and hit Ok. 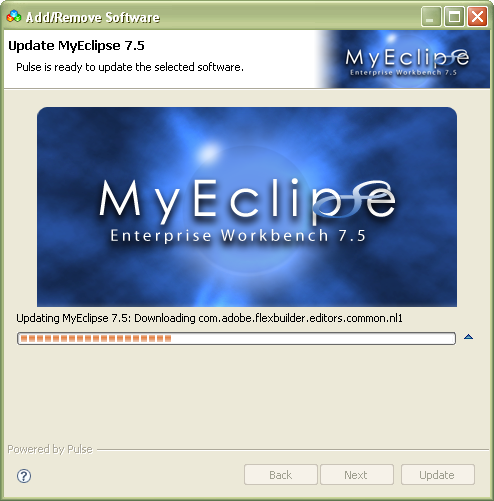 I was struggling to configure FLEX on MyEclipse 7.5, it really helped me to get rid of the problem and saved a lot of time.